If Halloween season is the only time you purchase pumpkins, then you might want to consider changing it. Pumpkins are packed with nutrients and can benefit the body in many ways. Pumpkins can help you manage a healthy weight, improve your immunity and eye health, maintain heart health, reduce the risk of developing cancer, prevent the symptoms of aging skin, reduce inflammation, and may even improve sleep quality. If pies are all you can think of if you have to cook with pumpkins, then here are a few healthy yet delicious recipes that can help you change that thought! If you are tired of having the usual breakfast cereals in the morning, then it is time to put some twist on it! Add some flavor to your oatmeal with fresh or canned pumpkins. This dish is filling and healthy and is quick for someone with a busy work schedule. Steel cut oats are used in this recipe. The only downside is that it takes longer to cook but that should not stop you because you can cook them overnight. Place all the ingredients in a 4-to-6-quart slow cooker and stir well so that all the ingredients are mixed well. You can cover the cooker and cook on slow for 7 hours overnight or cook on high heat for 3½ to 4 hours until the oats are soft. Remove the lip and stir evenly. You can top your pumpkin oatmeal with toasted pecans, dried cranberries or any other fruit of your choice, peanut butter, or even chocolate chips. What’s better than a soup to keep you warm during the winter season. If you are tired of the usual soup recipes, here’s one that you can try to spice things up a bit! 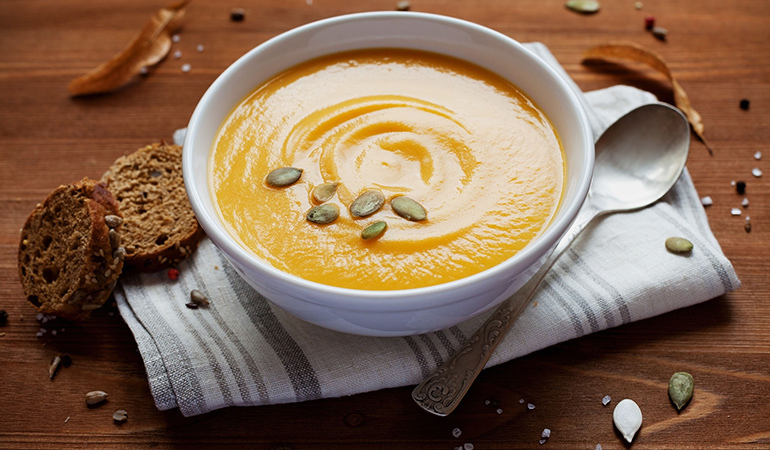 Double the benefits of your pumpkin soup by topping it with nutritious pumpkin seeds. In this recipe, a multicooker is used. If you do not have one, you can cook it the conventional way using a large saucepan or pot. Set the multicooker to fry vegetables. Add the oil, onion, and garlic and fry until they are turning golden. Add the cinnamon and allspice and fry until they give out a fragrance. Add the sweet potato, carrot, pumpkin, and apples and fry for a few more minutes. Stir well, close the lid, and cook for 20 minutes until the ingredients are soft. Season with pepper and salt. Once cooked add the butter, then allow to cool a little and process the soup using a stick blender directly in the cooker pot, or transfer to a blender or food processor and blend until silky smooth. If the soup is too thick, you can add water or the stock to get the desired consistency. You can serve the hot soup topping it with cream and sunflower or pumpkin seeds or both. 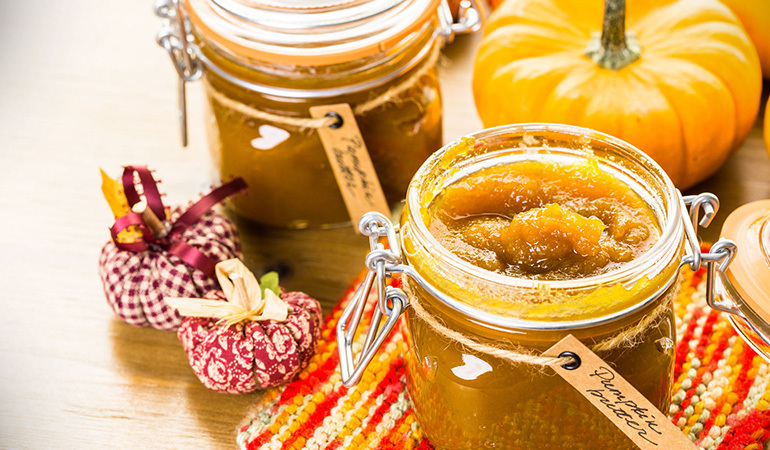 If you are bored of having the same toast and spread for snacks, use some delicious pumpkin butter to make toast taste better than it ever did. Dip your cookies, pretzels, crackers, or even fresh fruit in this yummy butter. Try this easy homemade recipe for an enjoyable snack time. Combine all the ingredients except the lemon juice in a large glass bowl that is microwave friendly. Cover with a loose, microwaveable covering like a sheet of wax paper or paper towel. Cook on high power for 6 minutes and stir the ingredients well. Cook for an extra 6 minutes and stir the mixture again. Repeat the same for another 3 minutes and stir well. Carefully remove the hot bowl from the microwave, remove the cover, and stir in the lemon juice. Allow the butter to cool completely and transfer it to an airtight container. Store in the refrigerator and used when required. 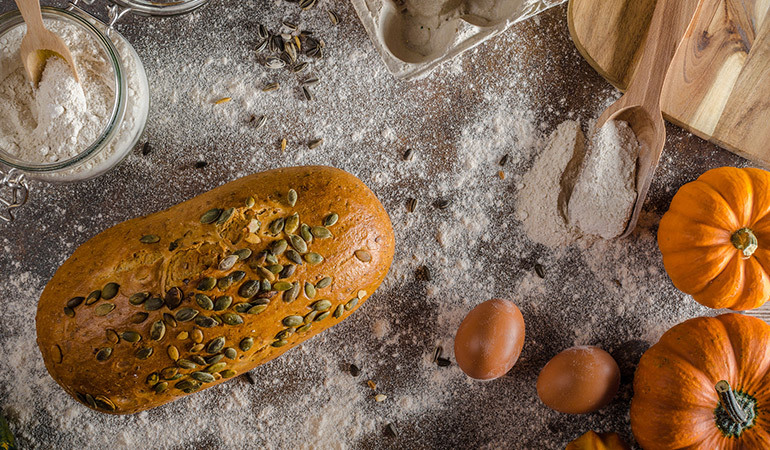 If bread is something you have never experimented with, you might want to try this healthy flourless pumpkin bread recipe for some sweet treats for snacks. If you have gluten sensitivities, you can always choose gluten-free oats to add to this healthy bread recipe. Grease the desired loaf pan with a non-stick cooking spray and place it aside. Mix all ingredients in a blender until you get a smooth mixture. Pour this smooth batter into the prepared loaf pan. Bake for 30 minutes and insert a toothpick to see if it comes clean. If the loaf is not cooked well, you can cover it with a foil so that the loaf cooks evenly. Allow the pumpkin loaf to cool and store it in an airtight container. Place it in the refrigerator after every use. If you thought hummus cannot get healthier and tastier, you are wrong! Pumpkins go well in the Mediterranean dish and can enhance the flavor. Serve it with fresh vegetables, pita bread, or even tortilla chips. You can also use this to flavor your salad. 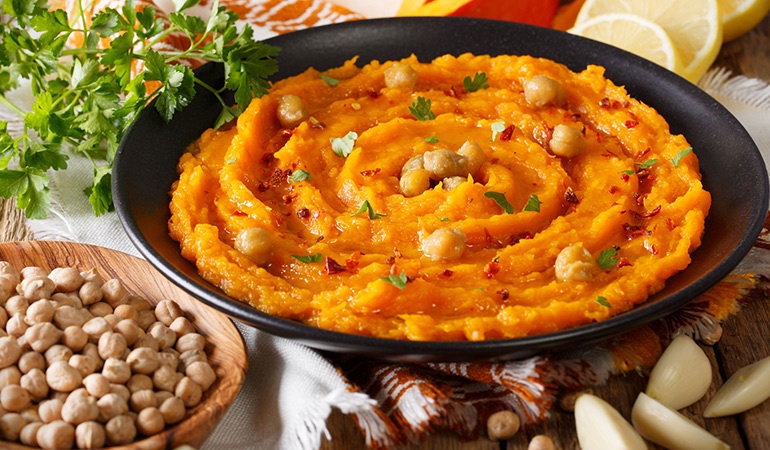 So, try this pumpkin hummus and surprise your family and friends with your secret ingredient. Combine all the ingredients in a blender and blend them until you obtain a smooth mixture. Remember to stop occasionally, to scrape down the sides of the blender. Spread out the hummus on a plate and drizzle some extra virgin oil over the top. 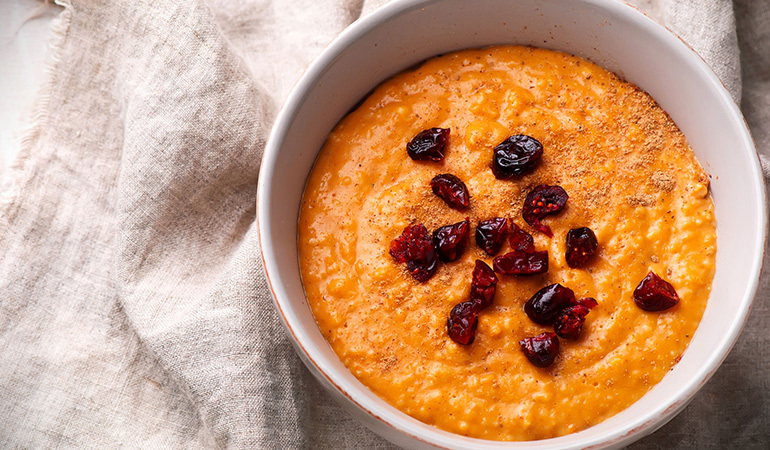 So, if you think pumpkins are only meant to be carved, then you definitely have to try these delicious, healthy pumpkin recipes and see if you want to add them to your favorite foods list! Fancy Salad In 5 Easy Steps: Plate Up! Lentil Benefits and Top 5 Lentil Soup Recipes.